There’s a small window of opportunity between summer and winter to experience the glories of crisp air and colorful leaves. During this too-short time, our region is bursting with adventures to undertake. Here are just 50 examples. We’re all about family-owned orchards. Pick your favorite kinds of apples at Curran’s Orchard, in Rockford; Edwards Apple Orchard West, in Winnebago, Ill.; Valley Orchard in Cherry Valley, Ill.; and Ten Eyck Orchard, in Brodhead, Wis. Yes, you can zip-line in the Midwest. Fly through the leafy abyss with Lake Geneva Canopy Tours, in Lake Geneva. Fall’s the time to taste sommelier-exalted reds, whites and rosés. Sniff and sip at Famous Fossil Winery, in Freeport; Prairie State Winery, in Genoa, Ill.; or Galena Cellars, in Geneva, Ill. and Galena. ‘Tis the season to wander aimlessly through tall stalks of corn. There’s a great one at Schuett Farms, in Muckwonago, Wis. Pro tip: It’s also a fun first date activity. Marvel at thousands of decorated pumpkins and enjoy fireworks, craft shows, a parade and more. The festivities commence Oct. 24-28 in Sycamore, Ill.
Art Deli, in Rockford, has a cozy assortment of hoodies and sweatshirts perfect for wearing in fall weather. These hand-printed, USA-made items can be found at the downtown store or online. Beautiful fall colors just make exercising better. Explore winding paths at Klehm Arboretum, in Rockford; Krape Park, in Freeport; and Riverside Park, in Beloit. When you’re not watching college football (Go Badgers!) or the NFL (Go Bears! ), get a pick-up game together at one of the aforementioned parks, or cheer on your favorite high school team. Enjoy the weather while it lasts. Rock Cut State Park is complete with tables and grills for public use. Cherished family memories are just waiting to be made. Pick a pumpkin, ride a pony and adore the petting zoo animals at Goebbert’s Pumpkin Patch, in Pingree Grove, Ill.
Local coffee shops have been waiting all year to unleash the Pumpkin Spice Latte. Try one at Meg’s Daily Grind, in Rockford and Loves Park. The merry sound of cowbells clanging means the boys are back. Home games are at the BMO Harris Bank Center, in Rockford. Go Hogs! Hop on a Limebike and head to one of many trails in our region, such as the Perryville Recreation Path, in Rockford, or the Jane Addams Trail, in Freeport. Who doesn’t love a holiday centered around fun and free candy? Dress up for one of Rockford’s “spooktacular” annual parties at Giovanni’s Restaurant & Convention Center, Francesco’s Ristorante or Prairie Street Brewing Co. Or, take the kids to a local trunk-or-treat. Gather a team of four and sign up for the “Beer Pizza Wing” league or the “Women Bowling with Wine” league at Don Carter Lanes, in Rockford. In addition to weekly bowling, you get to enjoy food and beverages. Pumpkins on porches, pumpkin carving, pumpkin seeds, pumpkin pie. Look around – our region is full of pumpkins and we’re not complaining. Happiness results from feeling warm and cozy, especially when temperatures drop. Enjoy sitting by the large fireplace at Oasis Micro-Pub, in Rockford, or visit Benson Stone Company, in Rockford, for assistance with installing a fireplace in your home. Once you have the fireplace installed, it’s time for the best part: decorating. Open two weekends a month, Urban Farmgirl, in Rockford, has all of the paraphernalia you need to make your home feel festive. Some may think cool weather marks the end of camping season, but it doesn’t have to. The scenery is even more gorgeous this time of year, especially at Starved Rock State Park, in Utica, Ill. Some of the museum’s best events occur during the fall, such as World War II Days, Scarecrow Harvest Festival and All Hallows Eve. Apple cider donuts and slushies from Edwards Apple Orchard are akin to heaven. Obviously, you’d need to wear a wetsuit, but West Rock Wake Park, in Rockford, is still open during the fall. October is the prime month to feel scared on purpose. See if you can make it alive through the Twisted Crypt Haunted House, in Rockford; the Trail of Screams, in Rockford; or the Karnival of Karnage, in Belvidere. When school resumes, many volunteer opportunities also resume. Help underprivileged kids celebrate their birthday with Rosie’s Birthday Club, in Rockford, or sign up to be a tutor through The Literacy Council, in Rockford. Now’s a great time to find some of the freshest produce (and funkiest gourds) around. Look for the best at the Beloit Farmers Market, in Beloit; the Edgebrook Farmers Market, in Rockford; and the Stephenson County Farmers Market, in Freeport. Leggings and flannel and scarves, oh my! Hunt for cute, comfy attire at Lallygag Boutique or Roxy Carmichael Boutique, both in Rockford. They make for great gifts year-round, but there’s something special about scents like apple cinnamon, vanilla bourbon and pumpkin spice. Fill your home with autumn fragrances you’ll find at JustGoods Fair Trade Marketplace, in Rockford, or Trove Vintage, in Rockford. Oktoberfest is back! Sample some yummy, fall-inspired flavors from New Glarus Brewing Company, in New Glarus, Wis.; Forge Brewhouse in DeKalb, Ill; or Generations Brewing Company, in Freeport. They go hand-in-hand with apple orchards, corn mazes and pumpkin patches. Step back in time with an old-fashioned wagon ride at The Lindberg Pumpkin Patch in Caledona, Ill. It sounds like a summer activity, but dress warmly and you’re golden for an afternoon on the river. Rocktown Adventures, in Rockford, can provide all the equipment you need. Keep your eyes peeled for signs of abnormal activity at Tinker Swiss Cottage Museum & Gardens, in Rockford. Paranormal tours happen Saturdays throughout October. Downtown Cherry Valley, Ill., is a wonderful sight during the fall, with eclectic scarecrows greeting drivers and passersby. Vote for your favorite now before the season’s over. Join a team or play pick-up games of volleyball, basketball, pickleball and dodgeball at UW Health Sports Factory, in Rockford. Ah, soup. It’ll fill you up and warm your soul, especially when the air turns chilly. Savor a bowl at Rockford’s Katie’s Cup, Wired Café or Mary’s Market, or a plethora of other places in our region. This mid-October rowing race on the Rock River beckons competitors from across the nation to bring their A-game. These tend to pop up in droves during the fall season to help you prepare for the holidays. Edgebrook Center has one every year with art, jewelry, clothing and more, plus, apple cider. It’s not too late to install a fire pit in your backyard for this specific purpose. LawnCare by Walter or Crimson Valley Landscaping, both in Rockford, can take on your outdoor projects. It’s the hallmark of Alice Cooper’s brand. He draws from horror movies, vaudeville and garage rock for a sinister performance on Oct. 24 at the Coronado Performing Arts Center, in Rockford. The fan rituals commence on Oct. 27 at the Winneshiek Playhouse, in Freeport. It’s a new tradition put on by the River District Association. This one-day music festival kicked off the start of the fall season, and we’re already excited for next year’s event. It’s an annual tradition at Aldeen Park on Thanksgiving morning. Do your best to win door prizes, turkeys, pies and more. All the good TV shows are returning, plus, fall is when the World Series ensues. While we may not be excited for it this year, our office had a blast celebrating the Cubbies win in 2016 (check out the back of our building). Fall colors are particularly stunning at this Rockford destination, and events are extra spooky. Bring the whole family to “Spook-Tacular Haunts” on Oct. 27 for crafts, games, trick-or-treating through the gardens and more. 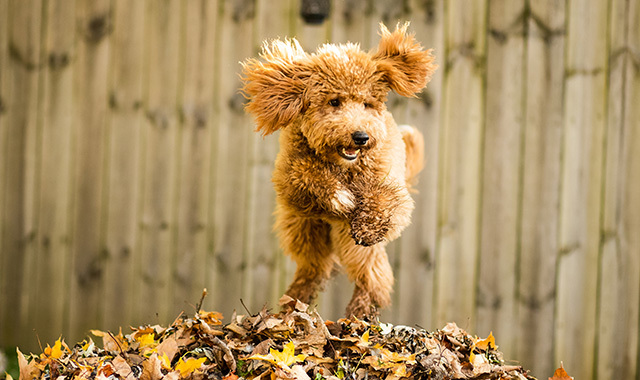 In case you missed our opening photo, Gryffindor, a Golden-Doodle, makes us love fall even more. He belongs to Samantha Behling, our graphic designer. Many-an-eater reveres this day. If you don’t feel like cooking, look into Thanksgiving-to-go packages from Francesco’s, Giovanni’s or GreenFire Restaurant, in Rockford. Arrive in costume for a night of crafts, slime and trick-or-treating on Oct. 26. Then, bring your leftover pumpkins to destroy with the help of a giant trebuchet on Nov. 4. Before your wintertime hibernation instincts kick in, treat yourself to a weekend trip. Worthy destinations such as Starved Rock State Park, in Utica, Ill., and Devil’s Lake in Sauk County, Wis., are just a few hours away. Fall is a prime time to explore the trails of Severson Dells after dark. Flashlights are welcome, but not encouraged. The next hike is Nov. 14. It’s become a huge event in Rockford, happening this year on Nov. 24. With live music, wagon rides, ice-skating, shopping and more, there’s plenty of ways to have fun before fall ends. This entry was posted on Tuesday, October 23rd, 2018 at 12:00 pm	and is filed under Features, Top Posts. You can follow any responses to this entry through the RSS 2.0 feed. Both comments and pings are currently closed.